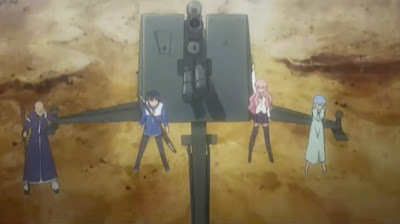 Another season of Zero no Tsukaima has ended. To be honest, I'm not really impressed. It seems the overall trend to be that in each season, one of the major supporting characters get to picked on and has to be saved by Luise. It just seems getting a little repetitive. One thing I did notice is that this season has a lot more mood swings. It could go from serious to wacky in matter of seconds. I don't think the previous seasons have as much mood swing as this one. Oh, one more thing, didn't they get married towards the end of the second season? Why nobody ever bring up that issue? Or did I misunderstand it? Recommendation: Well, if you've seen the first two series, I'd say spend the time to watch this, because there are more to come in the future that is building the bigger puzzle. If you haven't seen the first two series, I'd say hold it off, until next couple of seasons come out.